When I organised tours I regularly contacted the people volunteering at 2B (independent concert-place in the same street as the Effenaar) and Burgers (squatted place) in Eindhoven: Martin Voorbij (‘Scheet’, bassplayer of ‘Afflict’) and Marq (editor of Thrashold zine). 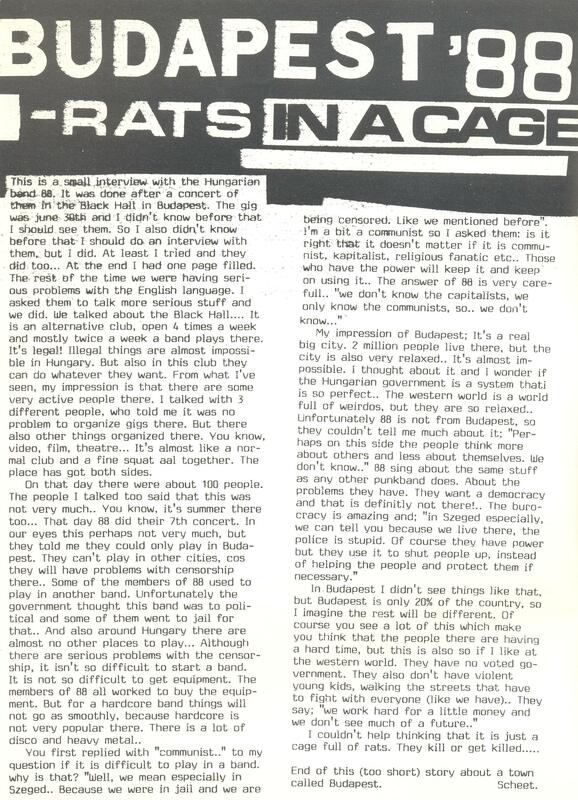 ‘Scheet’ had established a connection with HC/punk people/bands from ‘behind the Iron Curtain’ (The Berlin wall hadn’t fallen yet… He also played in the Slovenian electro punk-rock band ‘Strelnikoff’ at one time-point). 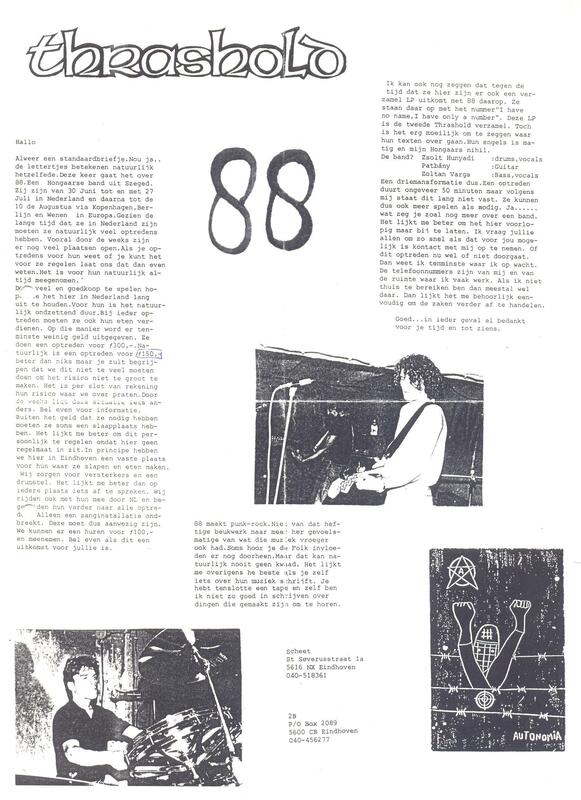 One of these bands was ‘88’ from the Hungarian town Szeged. They were Zoltan Varga (bass/vocals), Patbány (guitar) and Zsolt Hunyadi (drums/vocals). I’m living in Florida nowadays. I remember that beautiful city Aalst – Alost. The radio-studio upstairs, and the heat from the sun, when we were waking up with hangover from Tio Pepe and many beers. I also remember a long-haired beauty with whom I talked all night – in the morning I escorted her to home (nothing happened). The way back I couldn’t find the street where the pub was ‘cause I was so drunk. I wandered more than an hour till I found the pub. During our gig the microphone was electro-shocking me a couple of times. ‘Scheet’ told me the electricity was different than in Holland. I remember the couple working at the pub. They were looking like actors from an old French movie. Here you can listen to our demo ‘1984’. Our drummer stopped playing music 20 years ago, the guitar-player plays music with friends. In January 2007 I was in Aalst to see the carnival there. It was amazing!! !